Physical exams are the basis of wellness care as well as our first and foremost tool in identifying illness. Yearly examinations are recommended for all pets and senior and chronically ill pets often benefit from more frequent examinations. We offer a variety of vaccinations including vaccinations against Canine Distemper, Parvo Virus, Parainfluenza, Canine Adenovirus (hepatitis), Bordetella, Lyme Disease, Leptospirosis, Canine Influenza and Rabies for dogs and Panleukopenia, Feline Herpes Virus, Calici Virus, Feline Leukemia and Rabies vaccines for cats. Recommendations on which vaccines your pet should receive will be based on your pet’s individual needs. We follow the guidelines of the American Animal Hospital Association and American Association of Feline Practitioners on vaccinations. Our hospital is equipped with an in-house laboratory that enables us to perform many tests on-site including tests for Heartworm, Lyme, Ehrlichia, Anaplasmosis, Feline Leukemia, Feline Immunodeficiency Virus, gastrointestinal parasites and ecto-parasites. Additional testing capabilities include serum chemical analysis, hematocrits and urinalysis . We offer additional laboratory analysis done by an off-site veterinary laboratory for both wellness screening and a wide variety of problems. Proper dental care is extremely important to the health of your pet. Bad teeth and gums, not only cause pain, but they are a source of chronic infections for your pet, predisposing him/her to heart, kidney and liver problems. During your pet’s annual exam, his/her mouth will be evaluated. Any questions you have on proper care will be answered and if needed your pet will be scheduled for a dental cleaning. Cleanings are done under general anesthesia and are done with an ultrasonic cleaner and then polished. Any needed dental work will be done at the same time. Surgical and anesthesia procedures are provided on site by our veterinarian who is trained to provide many of the surgical procedures that your pet will need during his/her life. We use current anesthesia drugs and techniques and monitor pets with a combination of hands on and electrical monitoring equipment, including; respiratory monitors, capnography, EKG, pulse oximetry, blood pressure and temperature to help ensure the safety of your pet. Keeping your pet comfortable during any procedure is a high priority; therefore we place a strong emphasis on pain management using a combination of medications in the pre-operative, operative and post-operative stages. 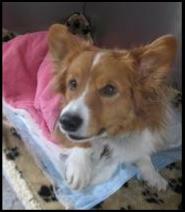 To help keep your pet warm and comfortable we use warming blankets and heated towels during surgery and postoperatively. We also have a radiosurgery unit that helps to decrease potential blood loss during surgery and which is very beneficial for gum surgery. 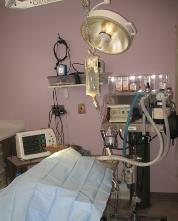 Cryosurgery is also available and can be used without anesthesia to remove small skin growths. We can perform blood pressure monitoring in dogs and cats. Hypertension is associated with several diseases of our small animals including hyperthyroidism, hyperadrenocorticism (Cushing’s disease), diabetes and renal failure. Electrocardiograms can be done to evaluate for heart disease and arrhythmias. If you own a purebred dog, which is predisposed to heart disease, you should consider routine screening of your pet. Some dog breeds that are predisposed to heart disease are the Doberman Pincher, Boxers, Cocker Spaniels, and some of the giant breeds. Radiographs can be performed and developed on the premise to help evaluate and diagnose a variety of problems in your pet. We can also perform contrast studies if needed. Echocardiograms, abdominal ultrasound and endoscopies are provided at our clinic by a traveling, board certified, internal medicine specialist. Glaucoma is a major cause of blindness in our pets. Your pet’s intraocular pressure (IOP) can be easily and painlessly checked to screen for glaucoma. Early identification of glaucoma may prevent blindness. Any dog or cat can develop blindness but the following breeds are considered to have an increased predisposition for glaucoma: Afghan, Akita, Alaskan Malamute, Basset Hound, Beagle, Border Collie, Boston Terrier, Bouvier Des Flandres, Cairn Terrier, Cardigan Welsh Corgi, Chihuahua, Chow, Cocker Spaniel, Dachshund, Dalmation, Dandie Dinmont Terrier, English Springer Spaniel, Giant Schnauzer, Great Dane, Maltese, Manchester Terrier, Miniature Pinscher, Norfolk Terrier, Pembroke Welsh Corgi, Poodle, Saluki, Samoyed, Scottish Terrier, Sealyham Terrier, Shar Peis, Shih Tzus, Siberian Husky, Smooth-Coated Fox Terrier, Tibetan Terrier, Welsh Springer Spaniel, Welsh Terrier, West Highland White Terrier, Whippet, Wire-Haired Fox Terrier, Persians, Siamese and some Domestic Short-hair cats. We offer counseling on a variety of behavioral problems including housetraining, undesired puppy behaviors, anxiety related issues and litter box problems. Microchipping is a quick and inexpensive procedure to provide permanent identification for your pet. If your pet is lost, a microchip can help them get back home and may even save their life. Hospitalization is provided at our clinic for patients requiring prolonged treatment. We are not a 24-hour facility and any critical animals requiring off hour care will be transferred to a 24 hour emergency facility. Our clinic is equipped to take care of emergencies that arise during regular operating hours. Critical patients requiring continued care will be transferred to a 24 hour facility.